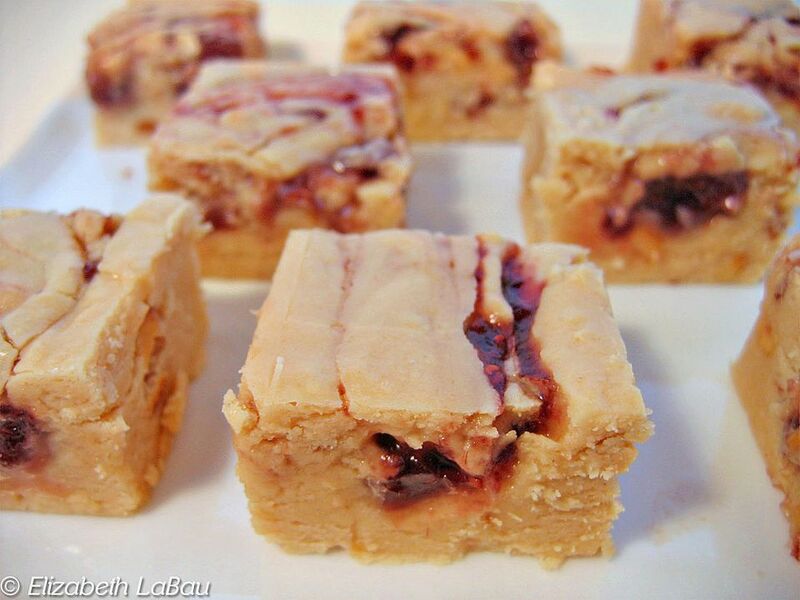 This recipe features the great taste of peanut butter and jelly in a smooth, creamy fudge. It is very important to work quickly and to make sure the jam is well-distributed in small amounts, so that there are not large pockets of runny jam in your otherwise solid fudge. Prepare a 9x9 pan by lining it with aluminum foil and spraying the foil with nonstick cooking spray. Place the sugar, butter, and evaporated milk in a medium saucepan over medium-high heat. Stir constantly until sugar and butter are melted and the mixture is smooth. Continue to cook the candy until it reaches a full boil. Continue to cook, stirring constantly, until the candy reaches 235 degrees. Immediately stir in the peanut butter, vanilla, and marshmallow cream, and stir until well-combined. Working quickly so that the fudge does not start to set, place small spoonfuls of jam or jelly all over the surface of the fudge, and drag a table knife through the fudge to create a marbled effect. Allow the fudge to set at room temperature for at least 2 hours or overnight. Once set, cut into small pieces and serve. Store remaining fudge in an airtight container at room temperature. Click Here to View All Peanut Recipes!